Join your fellow development professionals for an evening of fun, food and networking at Veterans Guest House. 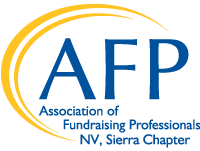 The AFP Sierra Chapter Mixer is a great opportunity to re-connect with professional friends and make new ones. Each year, the mixer is hosted by a different nonprofit organization. Come learn more about this year's host, Veterans Guest House, and the work they do in our community. We are asking everyone who can to bring a donation in support of the Guest House Wish List. When: Wednesday, August 22, 2018, 4:30 p.m -6:00 p.m.
About Veterans Guest House: For more than two decades, Veterans Guest House has served thousands of people - housing everyone from newborns to 90-year old's. Veterans Guest House gives our veterans and their family members more than just a warm bed. We give them peace of mind knowing they are close to each other. Our plans for growth have become a reality, and we are proud to announce the completion of a 12,000 square foot building. The expansion grows our facility from 17 beds to 33 beds.